It’s been so long since I’ve written an awards post! I’ve been so busy writing reviews and focusing on my instagram that awards have kind of just slipped through the cracks. To all the lovely people who have nominated me for an award of any sort, I really, truly do appreciate it and I apologize that it’s taken me so long to start catching up on them. I’m going to recap some of the nominations that have recently passed me by. If I missed yours I apologize, I’m quite behind! Since all of these awards require nominations I’ve chosen a few blogs in general, please feel free do do whichever tag you like, or none at all (no pressure!). I was nominated for a liebster award by Paula who blogs over at Flaw Decay. Please check out her blog, her makeup artistry is amazing and she’s also going cruelty free! Yas! What is the one beauty product you always repurchase? When I was 12, but only eyeliner and a bit of eyeshadow. I started upping my makeup game when I started this blog at 23. It depends. Most of the time I work later in the day so I give myself 30-40 minutes to drink my coffee and go through my skincare & makeup routines. If I’m rushed I compress it down to 10 minutes. A beauty product that you want to buy. I REALLY want to purchase a set of Morphe brushes! All the bloggers I read on wordpress! If you could only buy palettes from one brand, which one would it be? Do you like face masks? Favourite? Yes, my favourite right now is the Origins Original Skin mask. Last beauty product that you bought? I just ordered the ColourPop Give It To Me Straight Palette. What’s the best gift someone could give you? Their time. It means the world to me when people actively try to make plans with me. A lot of my friends don’t take the time anymore and I’ve felt like I’ve been pursuing a lot of one sided friendships. When someone is asking me to get coffee I notice. What’s your favourite paper night routine? What’s your a favourite place to shop? I was nominated for a Versatile Blogger Award by Sarah from Vintage Tea Rose. This girl takes the most beautiful photos and is really sweet so please show her blog some love <3 Thanks so much Sarah! I’ll take android over ios every time. I want to adopt a third kitten Ion & Quantum can have a sister kitty. Melina nominated me for the Mystery Blogger Award! Melina blogs at MelinaElisa and she’s the best! I feel like I’ve been friends with her forever when we chat across each other’s blogs. I love reading her book reviews, travel posts and bullet journal spreads. I’ve told my husband on several occasions when scrolling through instagram, “look! That’s my friend from New York!” It’s crazy how we all can become connected through social media. I have an older and a younger brother. My husband and two dapper cats. 3. What is the difference between your blogging persona and offline persona? My blogging persona is a lot more outgoing. I find it easier to build relationships with others online rather than face to face. I’m an introvert and I have this annoying tendency to assume that if someone talks to be they are actually speaking to someone else or that I’ being judged. I love how inclusive the blogging community is and I feel I can be my best self when I interact with people from behind a computer. 5. What/who is the biggest love of your life?Aside from the obvious choice, my husband, I would have to say music. And Cats! What is your favourite social media to use? NO CELLPHONES. Unless we’re taking a picture of something cool, but then it has to go away. My husband is constantly chatting with friends and family so when we’re going out I’m very stubborn about the cellphone rule. Put it away! ALL THE THINGS! I shake my head at the music “kids these days” are listening to. I keep a strict budget, stay in most of the time instead of going out on weekends, I knit scarves, and I’ve slowly watched my old friend circle shrink as I’ve gotten older (I’m only 25, but I’d definitely the old lady of the old group). For my questions I’m using the same as the award above. Choose any three! 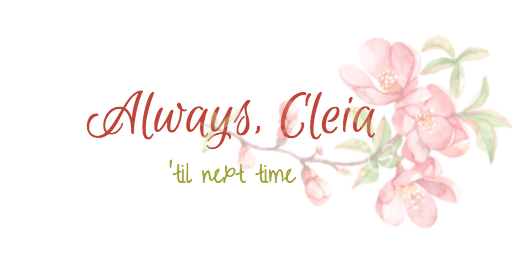 Haha Cleia I loved reading your answers to all of these questions! It’s so awesome to get to know you more. After reading your post I was like, “What the heck is Fitness Blender?”. I just looked it up and it’s free fitness videos?! That’s very cool and I am definitely going to check it out! I also love cats and mint chocolate chip ice cream, and I am a verified old lady lol. I used to be a huge knitter but haven’t in the last couple of years for whatever reason. I got into cross stitching, and then since starting my blog I really haven’t had time for any of that. I was shocked when I read that you work on your blog about 30 hours per week, but then when I think about it.. I probably do too! Wow. So weird lol. ahaha me too, my friends call me an old soul sometimes. Knitting takes so much time, I get tunnel vision when I start a project and can’t stop knitting until it’s done! That’s cool you do cross stitching, I hope you can find time for it! haha all those hours of taking photos and editing and thinking of new content, writing, promoting, etc… It’s strange to realize how much time we spend on our blogs! I think that’s so awesome that you play guitar, I’ve always wanted to learn, and I even have on, but i could never find the time to do the many things I’d like to do LOL do you play covers? make your own music? I’ll go ahead and answer some questions here, since I don’t do blog awards anymore. What’s your favourite paper night routine? — I don’t really have a specific pamper routine.. But I guess skincare is good enough for me. Online or In-store shopping? — Depends. If it’s clothes, in-store. Anything else, online. Coffee or Tea (or neither?) — Tea, with honey. Yum! What is your favourite skincare product? — I really enjoy all my face masks, whether they’re wash-off treatments of paper sheet masks. Haha! Blogging is seriously a time consuming hobby! Guitar takes a lot of time too, I wish I had more free evenings to spend practicing. I used to do more covers but I’ve been learning a lot of solo pieces arranged from videogames lately 😄 I want to start writing an album this year though! I used to always roll my eyes at my parents who only listen to music from the 70s and 80s, but I feel like I only listen to the 90s and early 2000s now 😆 It’s so typical! You’re welcome and that’s totally fine! I almost never do these awards either but they’re fun once in a while. Thanks for taking the time to answer a few of the questions! Ooo altered carbon, I’ve heard that the book for that show is amazing, I’ve got to read/watch the series! I know right?! I think that blogging has also taken up a lot of my time that I could be spending doing other things but honestly, I want to keep blogging haha. OH. MY. GOSH! IT’S A BOOK!?!?!?!?!?! I honestly didn’t know, I’ll have to add it to my reading list IMMEDIATELY! I love colourpop, so affordable! congrats & thank you for nominating me 🙌🏻 great to learn more about ya! thanks so much 😊 I enjoy yours as well! How can I thank you? Your recognition means so much to me! !